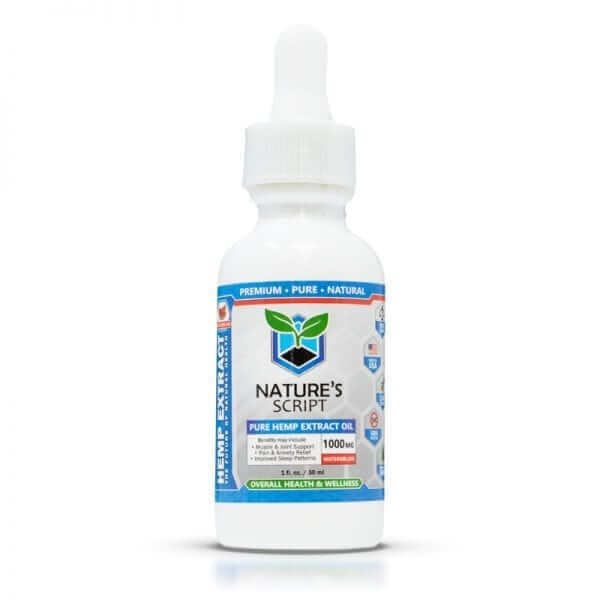 Nature’s Script’s CBD Oil is made from clean, pure Hemp extract which is packed with potential health benefits, including stress relief, sleep support and pain management. A few drops of Hemp oil a day can have a positive impact on your body and mind without harsh side effects. 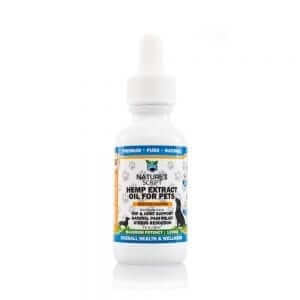 Nature’s Script Hemp Oils are sourced from premium quality, organic-certified Hemp and the purity of our products is verified by a third-party lab. Nature’s Script makes our CBD Oil from natural, organic Hemp Extract rich with potential health benefits. Our CBD Oil contains pure CBD, or Cannabidiol, which is known for it’s reported medicinal and therapeutic qualities in many areas of health. Hemp Oil is used to help treat a variety of conditions, including chronic pain, anxiety, insomnia and more. 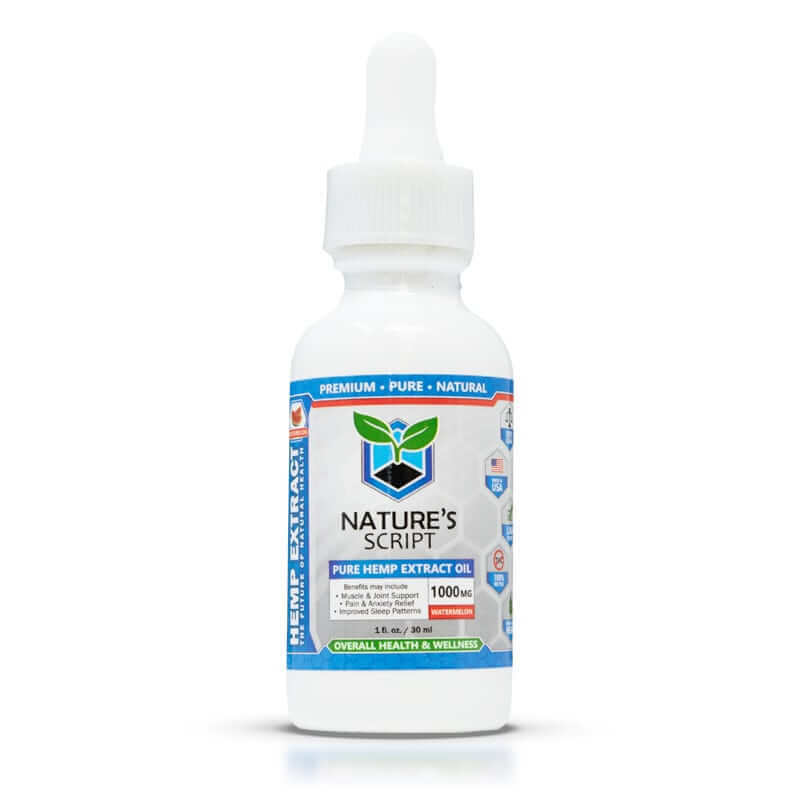 Found naturally in Hemp plants, our pure CBD is federally legal, non-THC and non-psychoactive. While our CBD Oil is often potent and impactful, it’s important to be mindful that Hemp Extract affects everyone differently depending on age, weight, gender and a variety of other factors. Our recommendation is to start with a low dose, like 5 to 10 mg each day. Slowly increase your dose until you feel you are taking a sufficient amount for your specific needs. CBD Oil serves to complement your body’s natural systems. It works to improve health by helping your body regulate essential functions like pain sensation, sleep cycle, mood, and immune response. Those who take Hemp Oil report an overall feeling of relaxation and tranquility, as well as a welcome relief from pain and inflammation. Common conditions that Hemp Oil can help with include insomnia, anxiety, chronic pain, inflammation and more. Unlike traditional medications, Hemp Oil is not linked with any severe side effects. Never had better sleep! Nature’s Script Hemp Oil is now my ‘go to’ oil for my insomnia. Great hemp oil. The peppermint flavor is actually very pleasant. And I’ve found it is effective for sleep and anxiety. Great hemp products and excellent customer service. A++. Made my first purchase with Nature’s Script. The ordering process was very easy. Great company! Products and service are both super. I chose the 1000mg peppermint hemp oil, based on a good friend’s advice. Need some help with insomnia. I found my new CBD Oil. Outstanding pain reducer. Love it. I’ve never taken something that made my eye lids so heavy I couldn’t keep them open. This stuff is amazing. And it’s hard to believe it doesn’t take a prescription to get. I am new to hemp oils. I have to say it really helps calm me down and just generally feel better. Customer service was excellent in helping me choose a product. Love the light peppermint feel of the oil. Just ordered and it already shipped. Can’t wait to try. Have tried a few oils and this oil is definitely one of my favorites! Love the watermelon. This is seriously strong stuff. I have not slept this well in ages. Thank you Nature Script. First experience with Hemp oil. It is helping my pain a lot so far. Been taking it for a week and today I didn’t take my regular pain pills, and I feel great. i’ve been a huge hemp oil fan for about a year now, and i’m so happy with this new brand. i haven’t been able to find an oil this strong EVER! the peppermint flavor is so light and cool and i feel the effects really quickly. Felt I needed a slightly stronger dose since I had tried the 1000mg previously. I love this oil and I have been able to reduce the amount and receive the same benefits. I recently purchased the 1000mg hemp oil in peppermint flavor. The bottle is really nice and sleek, looks high quality. The oil is easy to take and comes with the dropper. When I put the oil under my tongue, I can feel it starting to absorb into my system. I take the oil for chronic pain following a head injury and it really helps. I typically take it 2 to 3 times a day depending on how I feel. It’s stronger than other oils I have tried, but that’s good because I can use less and make it last longer. I am very happy with this product. Had an excellent experience with Tyrell in customer service. He told me how the products worked and even provided me with a discount coupon on the spot… Just bought the high potency hemp oil. The Watermelon is milder than I figured it would be. The flavor is too light. After thoroughly enjoying the 300mg Hemo Oil, I used a coupon code to make a new order for the 600mg Oil. I am curious to see/feel the difference between the two. Ordered a few days ago and already got my package. I tried it out and felt extremely calm after. I love this it has helped with my pain since I am old and have arthritis. Had no effect on me unfortunately. A very high quality hemp extract oil. You can tell by the way it makes you feel and how quickly it happens. It’s a winner. I think the 1000mg is my magic number. I’ve tried the 300, 600 and they do as good for me. love it for great sleep. I really didn’t know what to expect with the hemp oil. I didn’t have any past experience to compare to. All I can say is WOW. It really does knock me out and relax me so I can fall asleep. My dropper came with a tiny hole in the rubber part. So it won’t work right and I can’t fill the dropper up. Boo. It’s very clean tasting and easy to take. Just a couple pf drops and it’s off to bed for me. This is by far the best oil that I have ever tried. The watermelon is my favorite. I can’t get enough of this oil. =-) It helps relax me so much. I was very skeptical using this product mostly because i did not believe in it but after the first week i will be buying a new bottle every two weeks. Nature’s Script is amazing and I just love this. I had heard of the hemp oil, but never tried it. this watermelon one is superb! Wonderful for sleep! I use it every single night. My products arrived very quickly and I will be taking the oil tonight before bed. 5 stars for speedy delivery. 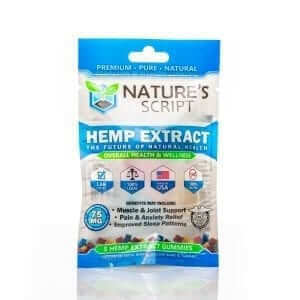 I’ve tried 3 brands of hemp oil and none of them have been as effective as Natures Script. Is the hemp more pure? More potent? Why does yours work so much better? I dont think that I should have bought this high of a strength. It is so strong! Its probably going to last me forever! I talked to the customer service people and they told me to take it by drops instead of the normal half dropper dose so it wont make me so sleepy. I would suggest to everyone out there, get the lower dose first and move up if you have to!!! This is THE BEST hemp oil I have ever used. It’s perfect. The flavor isn’t overdone, the effectiveness is excellent and the price is in line for a high quality hemp oil. 5 stars all day. I wasnt really sure about even trying this oil. The idea of a “hemp” product just kinda rubbed me the wrong way. But once I tried it, I realized how good this is for my anxiety and it even helps with my pain. Thanks to my doctor, who told me about this oil. i have restless legs at night that keeps me from sleeping. This oil stops the twitching and pain, and allows me to go to sleep. this is so discreet! I keep it in my pocketbook and take it throughout the day when I need it. I love the Peppermint flavor. Not too much, just right. And fresh breath to boot. Put my friends onto this oil after purchasing the 1000mg, best stuff honestly. Love the packaging and product, helps with my hand pain. Like the watermelon flavor better than the peppermint. Definitely recommend this product. Your 1000mg hemp oil is a VERY high quality oil. I’ve tried many other brands, at different milligrams. Even other 1000mg oils aren’t nearly as effective as yours. Thanks. My new favorite hemp oil. It’s great! You’ve got a great company that makes great hemp products, Thank you. It’s nice to find a product that works as claimed. This is one of those. My sleep has never been better. I like the oil, but maybe the potency isn’t right. It’s relaxing me, but not putting me to sleep. I received my package much quicker than I expected, especially during the Holidays. Big thanks to your shipping department. So far I’m enjoying this product. I put a couple of drops under my tongue and I have seen improvement in my sleep. Your products and service are top notch. Glad I found your brand. Well, I’ve tried many other competing brands of hemp oil overt the past few months. 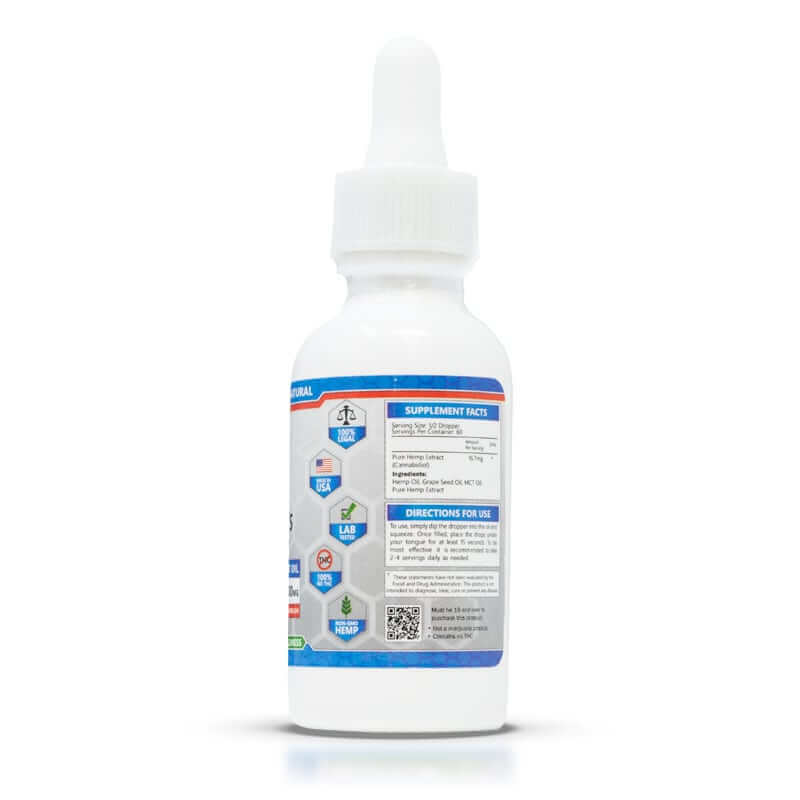 Your Peppermint 4000mg oil blows them all away. It’s more effective and the customer service is excellent. I liked it and the way it made me feel… Although it burned my throat a little going down, but I’m new to hemp oil so maybe that’s just because it’s a strong potency. Your watermelon flavored hemp oil isn’t as good as the peppermint. Doesn’t taste like real watermelon, Is that a harder flavor to imitate? Used a discount code to get the 4000mg oil at a great price so I bought 2 bottles. Thank you all. Fantastic hemp oil. Well worth the money. Honestly, I’ve never slept better or deeper. It’s hard to impossible to put a price on that. Thank you SO MUCH! This is powerful. I use it to relieve my back and hip pain. I’m now off my prescription medication and using nothing but your hemp oil. Works wonders for sleep. Two dropper fulls at bed time and I am gone. I like the Watermelon flavor best. Getting to sleep is no longer an issue since taking your hemp oil. Can’t thank you enough. Finally sleeping! I am so grateful my doctor suggested I try hemp oil. It works so well now I want to try other hemp products. It works consistently for my arthritis pain all over my body. Impressed with this oil. I might try the next higher potency next. Almost finished with this 300mg bottle. I’ve told my family and co-workers about the hemp oil. You’ll be gaining some new customers very soon. AMAZING!!! My sleep has improved DRAMATICALLY since starting on the hemp oil. A good friend had told me about it and I dismissed it. I had NO IDEA hemp could do this for sleep. I wonder how many others this could help. Anyway, thank you a thousand times Nature’s Script! Oustanding! is the word I use for this product. Thank you Nature’s Script! Very good site you have here but I was wondering if you knew of any community forums that cover the same topics talked about here? I’d really love to be a part of online community where I can get feedback from other experienced individuals that share the same interest. If you have any recommendations, please let me know. Thanks a lot! Tastes good and it’s good for my insomnia. Very happy. I’ve always had a difficult time falling and staying asleep. I have tried about everything. I came across your website doing searches for help with insomnia. Tried the hemp oil and I was very surprised that it does work – really satisfied with it. I’ve been telling all my friends about your company and the hemp oil for sleep. You should see them buying soon. Got my oil in the mail today. Going to try it tonight before bed right after dinner. Looking forward to sleep. The website is very informative and I was able to use that knowledge to buy the hemp oil. I can’t wait for it to arrive. Works! Better and faster than pills. Very potent oil! I love it. This is pretty amazing stuff. It hurts in the wallet, but I crave every dropper full. after trying the peppermint, I just finished my bottle of watermelon. I definitely think the peppermint is a better flavor. I found them both to work the same, but the peppermint has a better flavor. very mild. I use this oil to get my daily dose of hemp benefits. It works well and tastes great. Oil is GREAT! I’d like to see some more flavors. I’m new to the whole hemp thing. Although I’ve been hearing a lot about it I am still skeptical. I purchased this oil and will review it after using it. Ordering was easy. It seems to help a little with pain and with sleep. I only started using it this week so it will take more time to give a more positive review of the product. This oil ABSOLUTELY WORKS! I take two droppers full before bed and it is lights out for me. I sleep like a baby. Very happy with it and would highly recommend for a great night’s sleep. Excellent for pain. I will buying it again. It really helps with joint pain like nothing else. My oil arrived today and I started using it right away. I felt totally relaxed in just 5 minutes. I’m a true believer! Was a bit skeptical at first, but it seemed to work well. I think I may buy a higher dose next time to see how much of a difference it makes. This was my first time using CBD Oil, so I bought the 600mg just in case it was too strong. Going to buy the 1000mg next to compare the two potencies. I was surprised at how light the oil was, I was expecting it to feel like heavy oil under my tongue. I hve been useing cbd and hemp since June of 18 .I like very much. I am just about finished with my bottle of watermelon flavor and I just ordered a bottle of the peppermint flavor. I am so happy I took the plunge and tried this. I am getting the best sleep I have had in years and my fibromyalgia pain and inflammation have decreased dramatically. 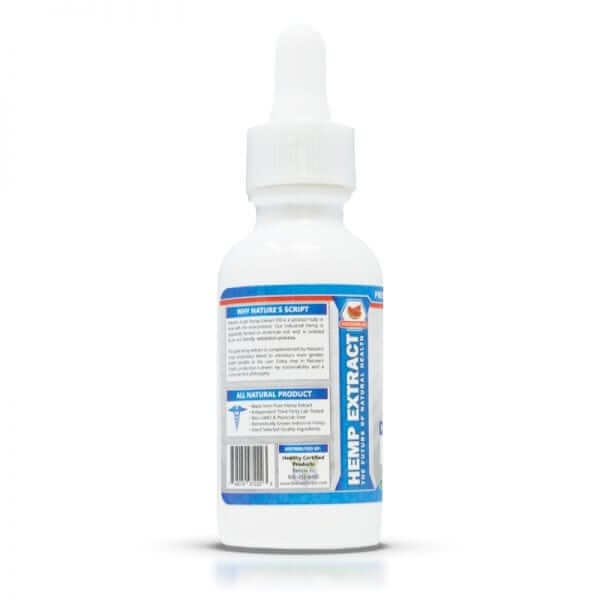 I purchased this product because I’ve heard it helps you get better sleep, and also for my husband who has a lot of neck pain. 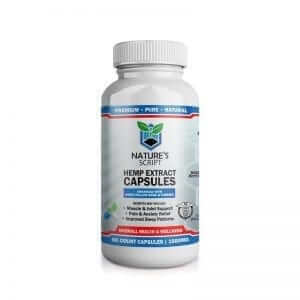 We’ve only used it a couple times and we really like it and the Watermelon flavor is really good, but I am most satisfied with the awesome customer service of Nature’s Script. I received the wrong product in my order, and I called the customer service number and they immediately sent me out the correct product and even gave me an extra bottle. I can tell they truly care about their customers and I would definitely recommend ordering from them.